What a great master bedroom space, right? (see the entire article on in Modern Luxury Dallas) Studioten25, owned by Abbe Fenimore, did an AMAZING job!! 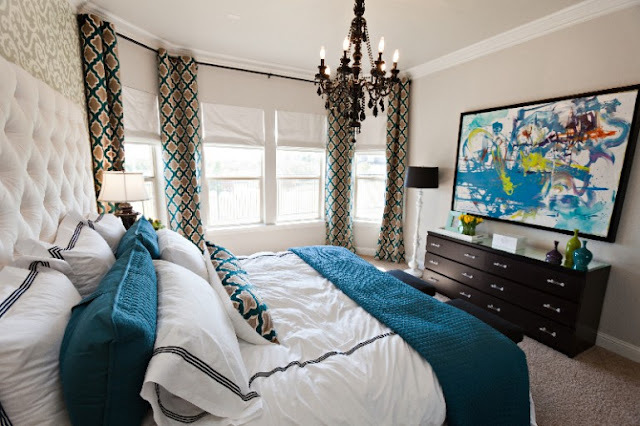 I just LOVE the turquoise as a pop on the white and ESPECIALLY that cool lumbar pillow on the bed! It looks so clean and modern and no fussy muss with tons of pillows. Lookie what popped up last week in Homegoods? 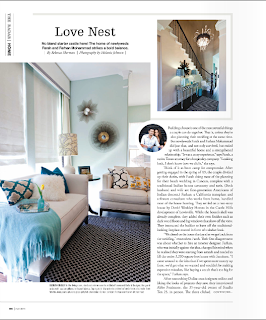 -Proof that looking at pretty pictures can help you recreate a pretty space in your own home. -You could build a similar room with this pillow that you bought on a budget! -Seeing what is on trend (from designers who know) can help you choose the right items when you shop! WOW! I love that pillow, what a great snag!! Such a fabulous post and thank you so much for featuring our work. Your blog is great and I am adding it to my daily reads!!! Thank YOU Abbe! Your work is just gorgeous! And....I've been drooling over www.shopten25.com for the past HOUR!!! LOVE!!! WOW I love that master bedroom! I meant to feature Abbe's work a while ago but totally forgotten about it. Her work is truly gorgeous, isn't it? And I just love the big white turfed headboard! Oh, and the geometric rug in the home office, I am totally drooling! I have been loving the rug for a while (I first saw it at Horchow) and then I kept seeing it pop up all over designer's space! Great find as usual, Shelli! One of my favorite designers- GREAT find!! GORGEOUS! I LOVE that pillow too!